Her elements of surprise meet their match in his determination to succeed. With vastly different motivations, can they break down the enemy without jeopardising themselves? DISCLAIMER: Due to Trent's foul mouth and sexual situations, this book is intended for mature readers. The first book in the much anticipated new series from Mila Rossi. The moment Samantha slapped Trent in the nightclub I wanted to cheer! I knew right then that I was going to love her character and their story. I wasn't wrong. Samantha is a tough, independent woman who doesn't take crap from anyone no matter how famous or good looking they are. Trent is an arrogant arse with a dirty mouth who needs to be taken down a peg or two. Samantha is just the girl to do that as she doesn't give a toss that he's famous. I loved how she didn't just fall at his feet like every other girl but instead drew him in through little acts of kindness and made him wait while they got to know each other. The more naughty scenes were very well written and not too frequent. I like a book to be more plot driven and I thought that the author got the balance just right. I didn't particularly warm to Trent very much simply because of his bad boy personality. We don't get to see Trent having that Eureka moment where he realises the boxing ring isn't the only place he has to up his game. I liked how he reached out to Samantha during his TV interview but I felt that Samantha deserved a little bit of grovelling before she gave him a second chance. Another reason why I liked Samantha's character so much is that we know more about her life. She didn't have an easy upbringing and if the novel had been longer I would have liked that aspect to have been fleshed out more. We got glimpses of the peril she faced growing up and I thought it could have made an interesting subplot with an element of suspense had the author wanted to go in that direction. Or maybe I just wanted to see Trent flex his muscles a little bit outside of the ring. 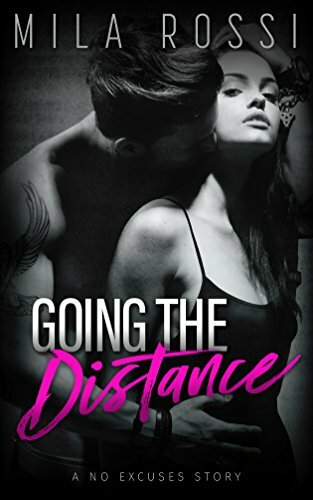 Overall, Going the Distance is a fast paced, addictive read and I can't wait to read the rest of the series. I received an advanced reading copy from the author in return for my honest review.